Shaolin Small Hong Quan is the basic boxing technique routine of Shaolin Kung fu martial arts, is a compulsory routine learning Shaolin boxing, known as the "mother of eighteen.". Step type small Hongquan and step, step, squat, lunge, empty step, basically arranged a common step boxing styles; the hand with palm, fist streaky catch; technique of pushing palm, marketable, wrench, cut hand, hand, hand, grazing stopped up, grasping the hand hand signs a punch; boxing, boxing, boxing, split up on boxing, boxing foot side; a foot, foot, foot on the hook; leg had to play, play, dance; body has turned, shrinking; eye method, game, storm, stare at, constitute a complete hand, foot, body, eye, footwork, formed the attack and Defense Technology in one method of a system. 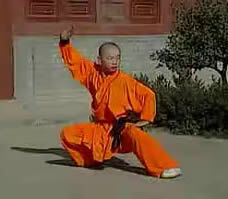 Small Hong Quan shaped posture is little and dainty, rhythm, vigorous and simple technique, no flower, recruit with defense, action combat, from first to last in line, highlighting the characteristics of Shaolin boxing.